Ultrafiltration uses hollow fibers of membrane material and the feed water flows either inside the shell, or in the lumen of the fibers. Suspended solids and solutes of high molecular weight are retained, while water and low molecular weight solutes pass through the membrane. This separation process is used in industry and research for purifying and concentrating macromolecular (103 - 106 Da) solutions, especially protein solutions. Ultrafiltration is not fundamentally different from reverse osmosis, microfiltration or nanofiltration, except in terms of the size of the molecules it retains. When strategically combined with other purification technologies in a complete water system, UF is ideal for the removal of colloids, proteins, bacteria, pyrogens, proteins, and macromolecules larger than the membrane pore size from water. The primary removal mechanism is size exclusion, though surface chemistry of the particles or the membrane may affect the purification efficiency. UF can be used as pretreatment for reverse osmosis systems or as a final filtration stage for deionized water. 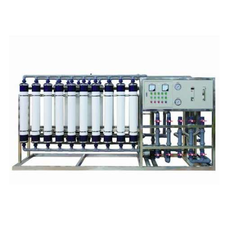 Looking for ULTRAFILTRATION SYSTEM ?